Infomed started in 1992 as a project of the Centro Nacional de Información de Ciencias Médicas de Cuba (Cuba’s National Center for Medical Sciences Information – CNICM), created in 1965 with the objective of responding to the need of facilitating information exchange among professionals, academics, researchers, students and directors of the Cuban Sistema Nacional de Salud (National Health System). Infomed became a PAHO/WHO Collaborating Center in April 2014, and its re-designation took place in April 2018 and is valid for four years. Keeping in mind the technical cooperation actions of the CNICM since 1984, when it was named a LILACS National Coordinating Center by BIREME/PAHO/WHO, Infomed’s Work Plan as a PAHO/WHO Collaborating Center presents many actions in coordination with BIREME, considering the development of the Virtual Health Library (VHL), LILACS, DeCS/MeSH and topics related to information methodologies and technologies for health information and knowledge management. PAHO/WHO Collaborating Centers are a cooperation mechanism of high added-value, established with designated institutions in order to support the implementation and execution of actions related to health strategies and goals at Regional and Global levels; to emphasize the scientific value of health; and to promote the strengthening of institutional capacity in the countries and regions by supporting PAHO/WHO programs. Contribute to the work of PAHO/WHO in the development of the VHL, with emphasis on the countries of Latin America and the Caribbean. Assisting PAHO/WHO in the development of human resources specialized in information and knowledge management. Assisting PAHO/WHO in the development of knowledge management and communication methodologies, as well as in joint projects and innovations, prioritizing digital literacy, scientific communication and library management. Development and innovation of the VHL methodologies and technologies. Development and implementation of new methodologies and technologies to strengthen regional index LILACS. Organization of the IV Meeting of the Network of VHL Developers, which will take place in the 10th Regional Congress on Health Sciences Information (CRICS). Development of capacities on the methodologies of the VHL information sources for Spanish-speaking countries. Development of national and regional infometric indicators of the VHL information sources. Other activities compose the Work Plan of the Collaborating Center, in coordination with the field of Knowledge Management and Publications (KMP) of the PAHO/WHO Central Office. According to Renato Murasaki, BIREME’s Information Technology Manager, “it is possible to affirm that BIREME/PAHO/WHO and Infomed are sister institutions that work with a common goal: Infomed, in its 26 years, represents the network of people and institutions that collaborate in order to facilitate access to information and knowledge, which are necessary to improve health; this existential essence is shared with BIREME, which, in its 51 years, contributes to the development of health in the countries of Latin America and the Caribbean through the democratization of access, publication and use of scientific information, knowledge and evidence”. According to Dr. Ileana Alfonso, Director of Infomed, “the re-designation is in recognition of the work we have accomplished, and we are proud to be able to place the experience we have acquired at the service of Latin America and the Caribbean, within the framework of the actions that have been defined in our Work Plan as a Collaborating Center”. 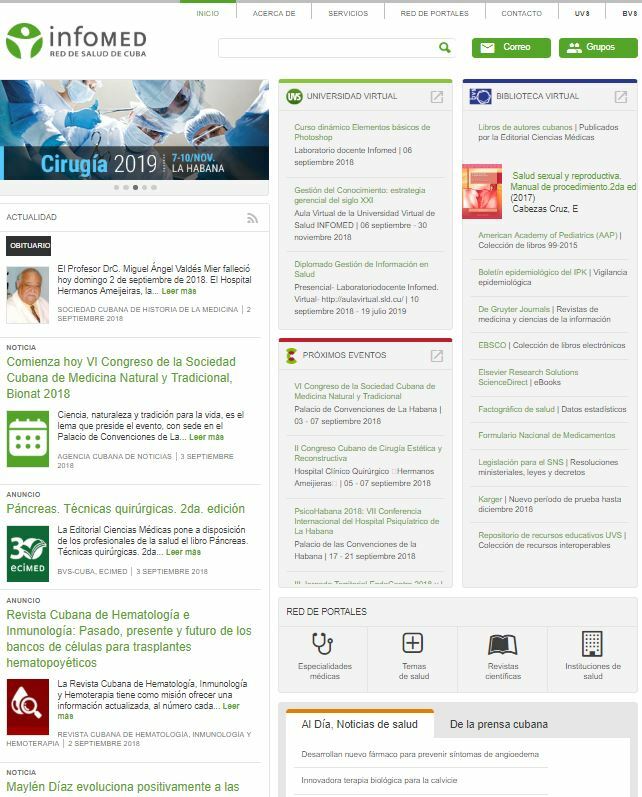 Infomed: Centro Nacional de Información de Ciencias Médicas, Ministerio de Salud Pública. ¿Qué es la Red Infomed? Available at: <http://www.infomed.cu/acerca-de>. Accessed on: August 24, 2018, 23:45:00. OPS/OMS Brasil. Rede CC Brasil. Available at: < https://www.paho.org/bracolab/>. Accessed on: August 25, 2018, 00:11:00. World Health Organization. WHO Collaborating Centres: Global Database. Available at: <http://apps.who.int/whocc/Detail.aspx?cc_ref=CUB-27&cc_city=habana>. Accessed on: August 25, 2018, 00:34:00. BIREME/PAHO/WHO. About BIREME: Mission. Available at: <https://www.paho.org/bireme/index.php?option=com_content&view=article&id=31:missao-da-bireme&Itemid=215&lang=en>. Accessed on: August 24, 2018, 23:47:00.